Interactive Technology: What’s SAMR Got to Do with It? What’s your big picture as it relates to using technology in your classroom? Do you strive to empower students to become 21st century learners that can more easily navigate and actively participate in today’s information superhighway? Unless you’ve been sleeping in a cave for the past 15 years, the 4 C’s, Communication, Creativity, Collaboration and Critical Thinking are on every teacher’s mind. Here are some thoughts on how I use interactive technology to enhance and transform learning. Let’s talk SAMR. What’s SAMR you ask? SAMR is a useful framework you can reflect upon when you want to design and evaluate tasks that target higher order thinking skills and student engagement using tech tools. The SAMR concept was developed by Dr. Ruben Puentedura. His tech integration framework helps thousands of savvy teachers to envision, develop and design motivating learning experiences so students can attain higher levels of achievement. At the substitution stage of SAMR, your technology tools act only as a direct tool substitute in your lesson, there’s no real functional change in the lesson. For example, when you first get an interactive whiteboard, interactive flat panel or SMART LightRaise interactive projector, your initial goal will be to take existing content lessons and convert these lessons into an electronic format for use on your interactive product. That usually means you’ll scan classroom and homework documents, and import a few content-related photos. At first this process may seem a little overwhelming (after all, teachers have hundreds of lessons to scan/upload! ), but you’ll become a pro at the S stage of the SAMR model right away! Don’t get too comfortable here or else your students will lose out on a whole lot of more-engaged learning! After you’ve transferred some of your traditional lesson content for use with your interactive product, it’s time to augment your materials/resources. Using SMART interactive technology, you can quickly start to incorporate interactive multimedia including video, audio, hyperlinks to websites, and more. These extras will enliven your original lessons! For fun you’ll add activities to reinforce understanding by using some of the latest tools in SMART Notebook …check out the newest SMART lab activities including Super Sort, Rank Order, Flip Out, Label Reveal and others. My absolute favorite SMART lab activity is Shout It Out!, it’s a wonderful go-to tool for brainstorming, reviewing content, generating ideas, and improving participation and collaboration using any device. Well, well, well, you’ve enhanced learning, now it’s time for some modification, it’s no longer about you. At this point on the SAMR continuum, it’s time to transform student learning and place students in the driver’s seat. Dr. Puentedura asserts that any use of technology can and should allow for significant task redesign of a lesson. One example of a modified approach might be to use SMART’s Concept Mapping feature within SMART Notebook. Students can map out a topic and decide upon potential directions to follow. Another example might include having students share the SMART amp workspace to collaborate on research and writing for a science or history project. SMART amp improves project-based and student-led learning using a multitude of devices and apps. All students can contribute and collaborate from anywhere at any time! Working together, students might share in the creation of a blog, give feedback on group or individual writing pieces, the ideas are endless. It’s easy to move back and forth from whole-class, small-group and individual instruction within the SMART amp learning space. This is a truly modified approach to engaged learning! In an ideal learning environment, redefinition of learning would be the rule, not the exception. In forward-thinking lesson design we should all aspire toward R. Redefined learning enables students to collaborate, demonstrate critical thinking skills, create messaging that’s reflective of their learning and show evidence for evaluative thinking. Doesn’t this sound like the 4 C’s concept? 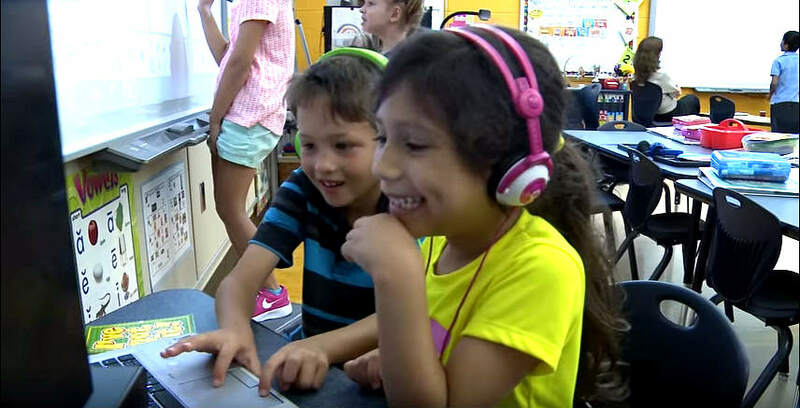 With the proper use of tech tools, students can work together creating content. They might be seen creating assessments for their peers (using SMART response 2 or Kahoot), or they may use EdPuzzle to add questions to a video they shot using a tablet. There are so many more yet-to-be-thought-of ideas that will transform their learning! Teams of students, working together, can take on any topic and fabulous learning can occur. Ask yourself when creating new lessons: What’s the worst that can happen with this idea? Don’t be afraid of failing in your lesson design, the kids will understand and be thrilled with the new, more relevant style of learning. A much wider range of skills is needed for M and R, but alas, this will most certainly lead to greater higher level learning and engagement. Just do it! Interested in Cathy’s approach with SAMR and the SMART solutions she mentions? They’re available today with SMART Learning Suite.